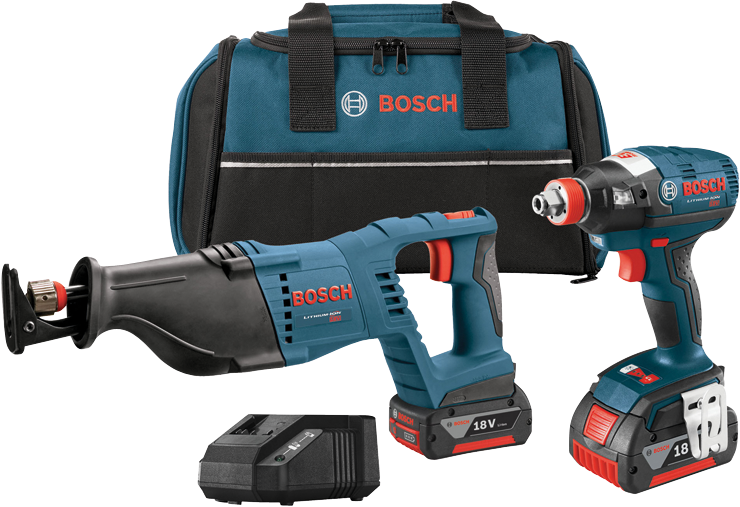 The CLPK204-181 18V 2-Tool Combo Kit provides all need to get cordless convenience on the jobsite with Bosch's 18V cordless tool platform. This kit includes the IDH182 EC Brushless 1/4 In. and 1/2 In. Two-In-One Bit/Socket Impact Driver, which is the all-in-one driver that does away with the need to buy both an impact driver and impact wrench. At only 2.4 Lbs., it provides a max of 1,650 In.-Lbs. of torque, making it the most powerful impact driver in its class. And the EC Brushless motor provides long runtime and is maintenance free. The CRS180 is a cordless reciprocating saw that also brings plenty of muscle, with a long, efficient 1-1/8 In. stroke, for more material removal per stroke. The saw features the easy Lock-Jaw blade-change system, for easy one-handed blade changes. The set is capped off with two 18V Lithium-ion FatPack batteries and a charger.